SUMMARY: Bone wax used in neurosurgical procedures is a rare cause of complications after surgery. We present a patient who developed paraplegia following thoracic spine surgery. A subsequent MR imaging study demonstrated a signal void that resembled postoperative air but appeared to cause cord compression and proved after a second surgery to represent bone wax. Recognizing the MR imaging and CT characteristics of bone wax is important to prevent mistaking it for residual air in postoperative imaging. A 70-year-old man presented with slowly worsening midthoracic back pain, lower extremity sensory loss, and mild symmetric weakness. His symptoms proved to be due to cord compression from an expansile mass extending into the posterior epidural space from the posterior elements of the T6-T9 vertebrae. This mass later proved to be due to multiple myeloma. Surgical decompression was undertaken, and the mass was excised. On awakening after the resection however, the patient was unable to move his lower extremities. An urgent MR imaging examination was ordered (Fig 1), and the findings proved to be puzzling because only a signal-intensity void appeared dorsal to the spinal cord compression. Differential considerations were packing material, air, and hematoma. A second surgical decompression was performed with removal of bone wax from the spinal canal. Despite additional treatment with steroids and physical therapy, the patient had permanent loss of lower extremity function. MR images of the thoracic spine in a patient who developed paraplegia after spinal surgery. Sagittal T1-weighted (A), T2-weighted (B), and postcontrast T1-weighted (C) images and an axial T1-weighted image (D) show a signal-intensity void posterolateral to the spinal cord at T6-T7, which appears to cause extrinsic compression of the cord but mimics the signal intensity of air in the soft tissues. This was found after a second surgery to represent bone wax. Complications due to bone wax are rare but can include infection, foreign body reaction, and mass effect. There are at least 2 published reports of bone wax causing granulomatous reactions after neurosurgical procedures. Patel et al3 reported a case of bone wax causing foreign body granuloma in the cerebellopontine angle in a patient who had undergone excision of a vestibular schwannoma. Ates et al4 reported a patient in whom remnant bone wax from posterior fossa decompressive surgery had infiltrated through the medulla oblongata. In both of these cases, granulomatous reaction manifested as an enhancing lesion on T1-weighted MR imaging, along with a central T1 signal-intensity void in the second case. Excess bone wax has been reported to cause mass effect in the spinal canal. Cirak and Unal5 reported a case in which they attributed quadriplegia following cervical spine surgery to epidural compression from bone wax and hematoma. T1-weighted imaging in that case showed a hypointense lesion posterolateral to the spinal cord at C6-C7. 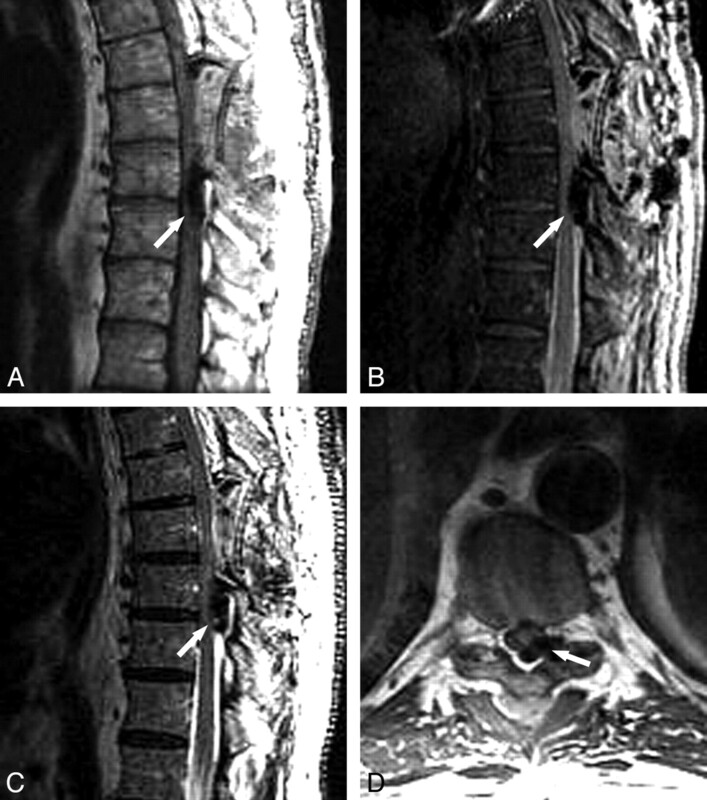 Eser et al6 reported a patient with radiculopathy following 2 lumbar disk surgeries in whom a 1-cm3 piece of bone wax was found to be compressing the dural sac and spinal root. Bone wax produces a signal-intensity void in T1- and T2-weighted images because it is a semicrystalline solid and has a T2* value that is too short to allow signal detection using conventional MR imaging techniques. This property is typical of all crystalline materials and can be observed as water forms ice crystals. 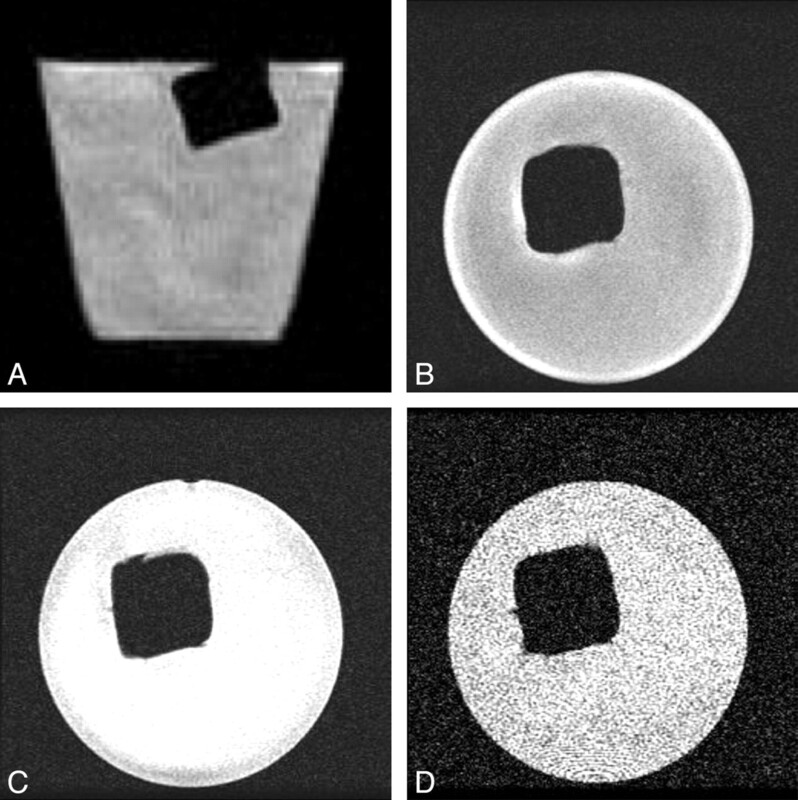 This phenomenon is the basis for MR imaging monitoring of frozen tissue in cryotherapy.7 Extending this comparison to ice, the MR signal-intensity void produced by bone wax is well-demonstrated by imaging a cube of wax floating in a cup of water (Fig 2). Coronal (A) and axial (B) T2-weighted MR images along with axial proton-density (C) and gradient-echo (D) MR images of a cube of bone wax floating in a cup of water demonstrate the signal-intensity void produced by the wax on all 3 sequences. Signal-intensity voids in the surgical bed on MR imaging can be attributed to both postoperative air and artifacts from surgical hardware. While air produces a signal-intensity void on MR imaging due to low proton density, it would not be expected to account for symptoms of compression. Surgical hardware also produces signal-intensity voids on MR imaging, but these materials can be differentiated from bone wax on the basis of the geometry of the artifacts. Furthermore, paramagnetic surgical hardware, such as titanium implants, will create susceptibility artifacts that typically produce a bright margin that is offset in the frequency direction. Bone wax has a magnetic permeability very close to that of water and soft tissue and, for this reason, would not be expected to produce susceptibility artifacts. With CT, the attenuation of bone wax generally falls between the low attenuation of fat and the intermediate attenuation of water.8,9 While CT should allow a more confident distinction of air and bone wax, review using appropriate bone windows is essential because their respective attenuations may appear identical when viewed only on soft-tissue windows. In conclusion, bone wax can be the cause of complications both late and immediately after neurosurgery. It is important to consider the presence of bone wax on postoperative MR imaging examinations so that it is not mistaken for residual air from the surgery. Careful evaluation of the MR imaging may allow this distinction, but CT can be very helpful when reviewed in appropriate windows. Accepted after revision July 14, 2009.